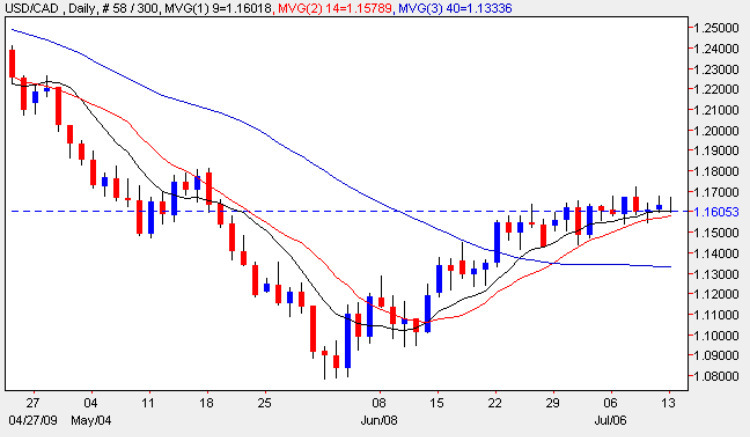 As with many other currency pairs the dollar to cad continues to consolidate sideways in an increasingly narrow trading range with Friday’s candle ending the session as a spinning top marginally above the 9 day moving average. The only items of fundamental news on the economic calendar for this pair are the BOC (Bank of Canada) Business Outlook Survey which is due out shortly. This is a survey or around 100 Canadian business which are asked to rate the current business climate with measures such as sales growth, investment in plant and machinery, employment and inflation expectation. Meanwhile in the US we have the Federal Budget Balance which is forecast at -95.0bn against a previous of -189.7bn. If the actual is better than forecast then this is generally considered to be dollar positive. In the background this week the markets are focused on the quarterly earnings season which if corporate results prove to be worse than expected will impact not only the equity markets but commodities, such as crude oil, as well.